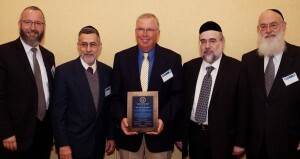 Barry Brown has been involved with OU Kosher for nearly three decades. He is a moral and ethical individual, a consummate professional, devoted to family, company, community and colleagues. He is vigilant in upholding production and kosher requirements with attention to every detail, thereby ensuring production of quality products coupled with the highest kashrus standards. Throughout the years, Mr. Brown has been a loyal friend of the Orthodox Union. We have taught him about kashrus and he has eagerly learned, even as he questioned us and when necessary, directed us. He has great respect for the OU and is never shy to publicly laud and applaud the virtues of the Orthodox Union. We in turn hold him in high regard, and are pleased to honor him for the person he is and for all that he means to the OU. Photo L-R: Rabbi Akiva Tendler, Rabbinic Coordinator, OU Kosher; Rabbi Menachem Genack, CEO, OU Kosher, Barry Brown, Quality Assurance Manager, TreeHouse Private Brands; Rabbi Moshe Elefant, COO, OU Kosher; Rabbi Dovid Rockove, Rabbinic Coordinator, OU Kosher.